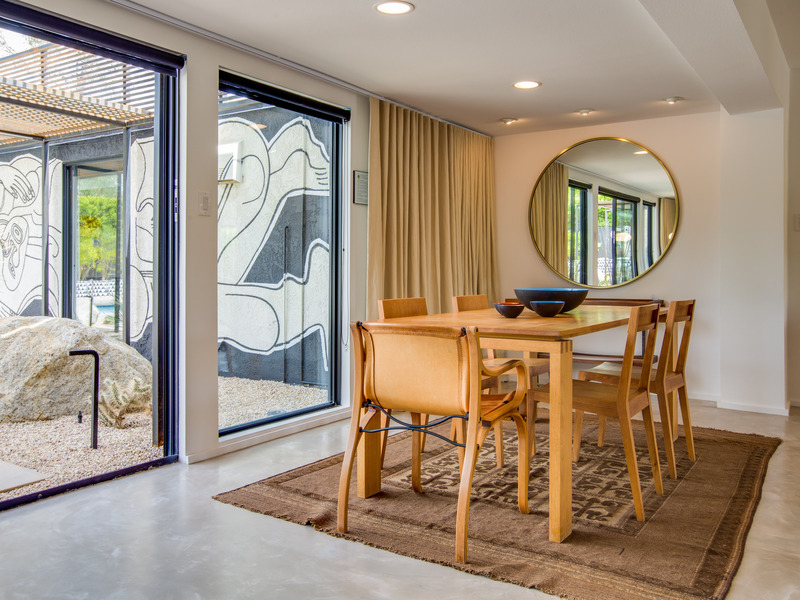 Welcome to the Mostero House where architecture, art, design and natural desert landscape converge to create a very special Palm Springs masterpiece. 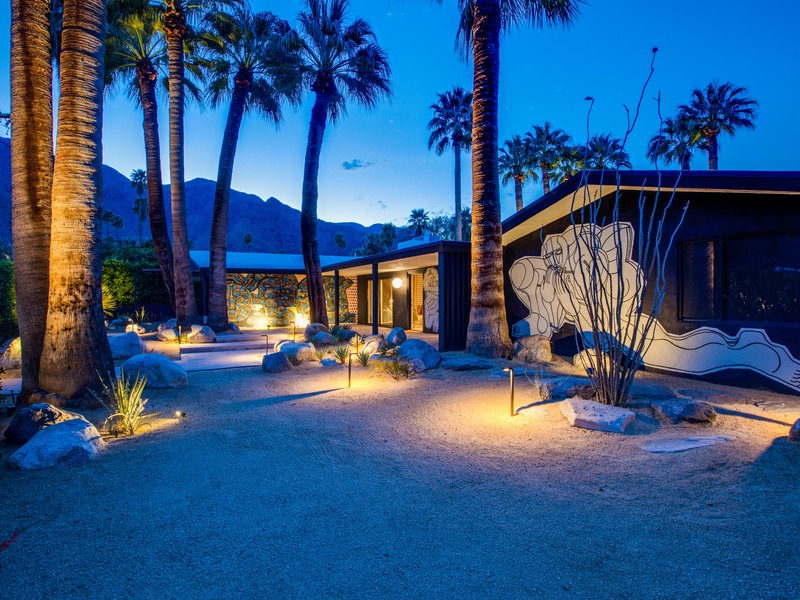 More than 3,000 square feet of pure desert decadence - an exceptional work of art and design that blurs the lines between indoor and outdoor living. 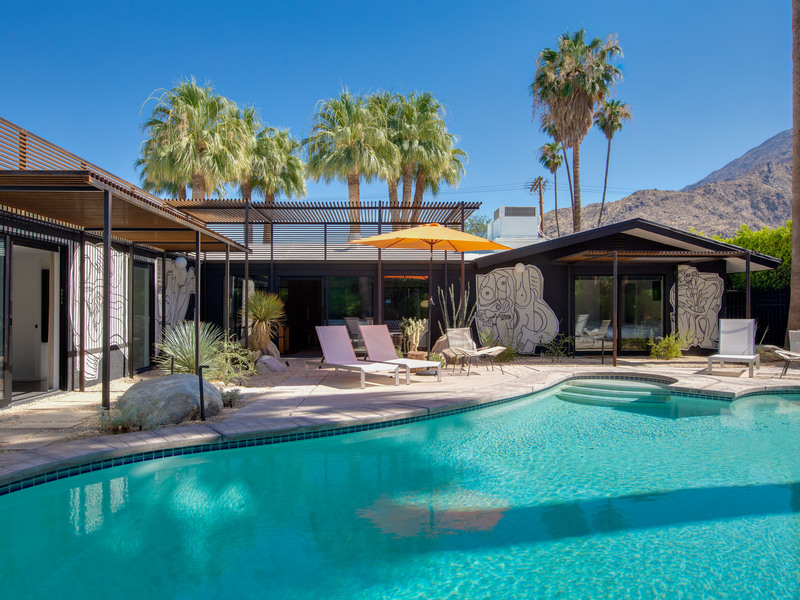 This is a very special property created for Modernism Purists who want to immerse themselves in the true Palm Springs experience. 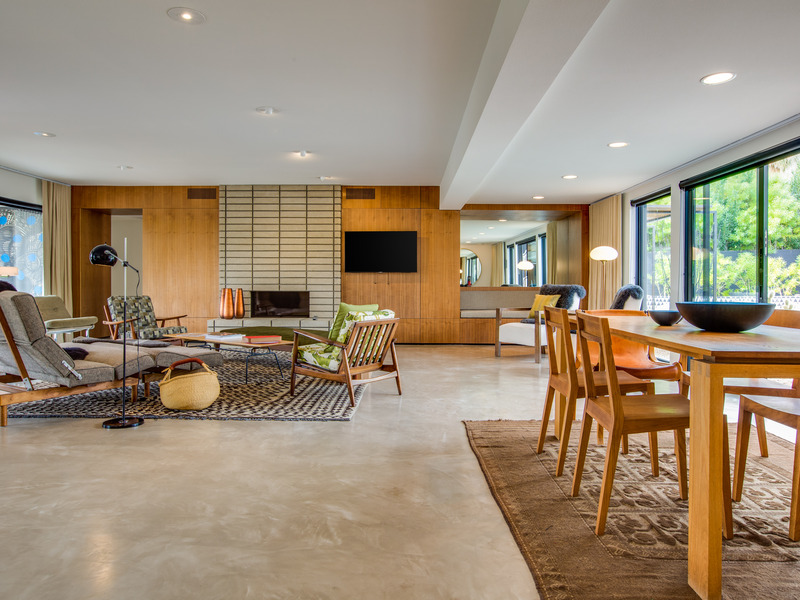 First built in 1954, this iconic ranch-style home has been entirely reimagined by the current owner - an architect who acquired the property from his family. 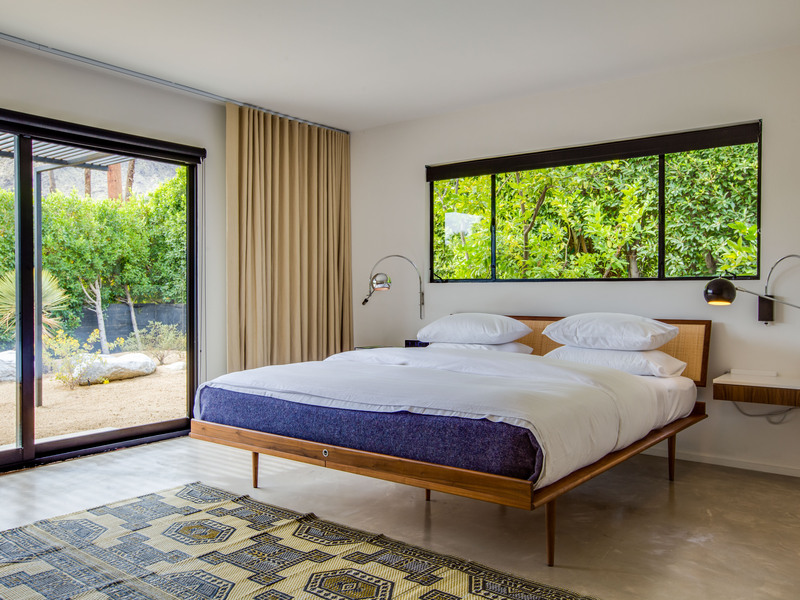 The home has been reconfigured to open up the interior while respecting its midcentury roots. 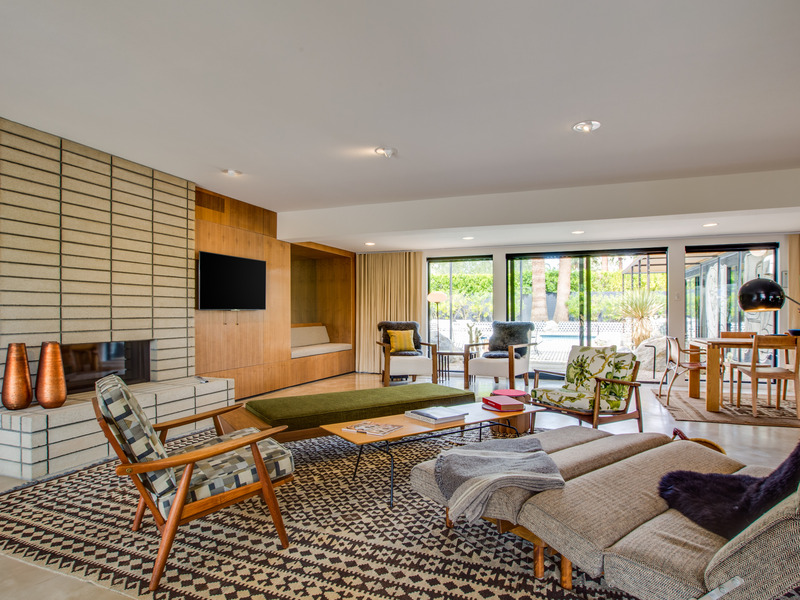 The result is an open concept floor plan with four deluxe sleeping quarters, an additional swanky mid mod lounge and expansive walls of glass that blur the lines between indoor and outdoor living in true Palm Springs style. 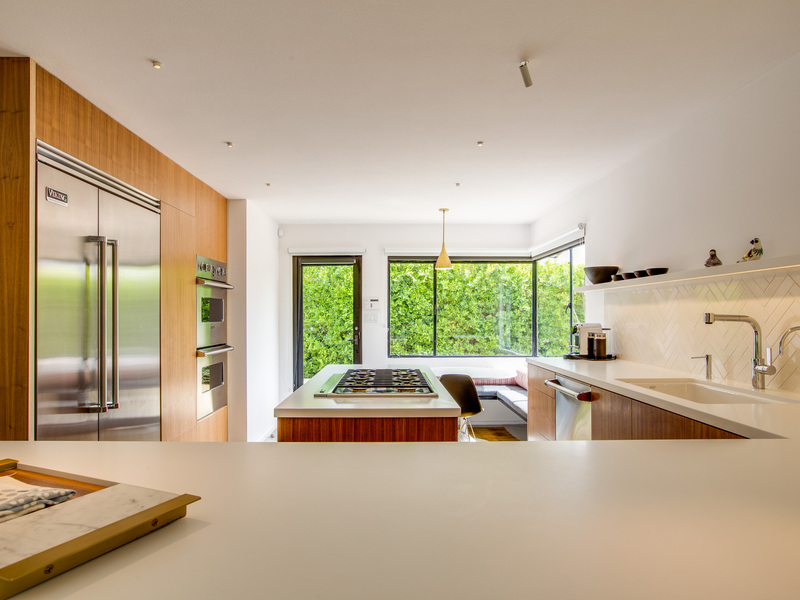 The modern kitchen opens to the interior dining and living areas. 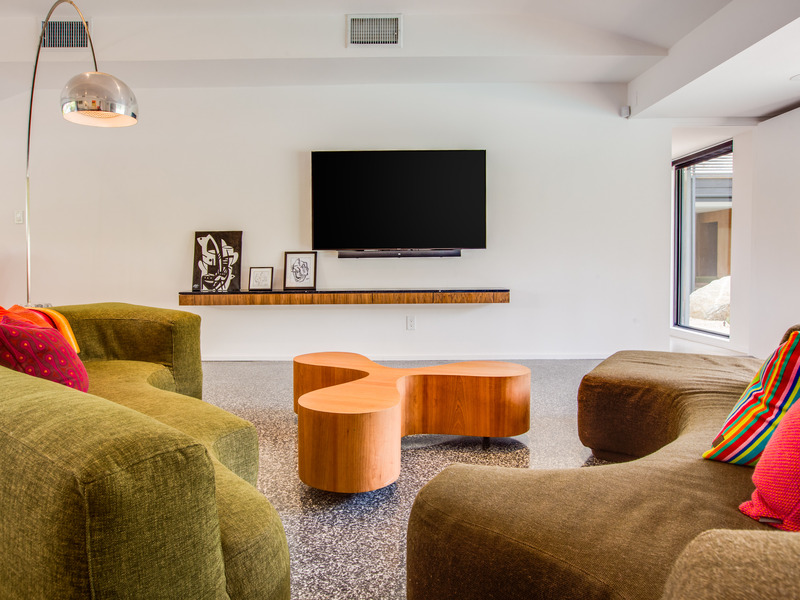 New finishes include period-specific brickwork for the fireplace, walnut paneling as well as polished concrete and terrazzo floors. 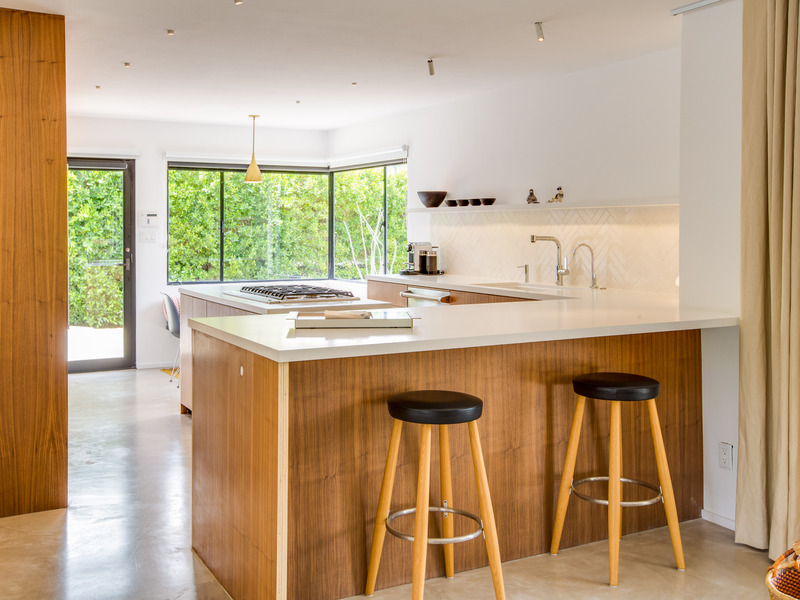 State-of-the-art recessed lighting sourced from Scandinavia enhances the home's modern aesthetic. 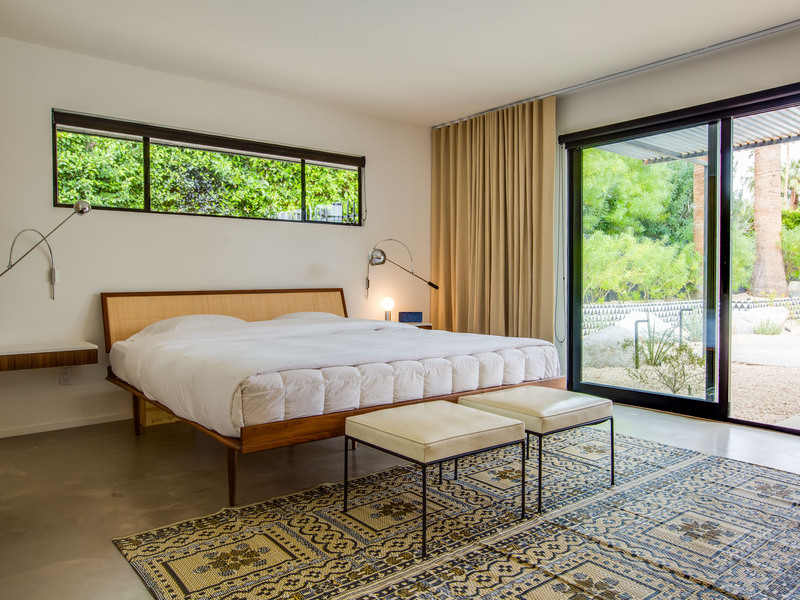 Furnishings include carefully selected new pieces by South American designer Carlos Vergara and French company Kann Design, along with treasures from the owner's collection by Hannah Morrison, Roberto Pamio, Noti Massari, Renato Toso, Arne Jacobsen among others. The grounds of this home are uniquely gorgeous. 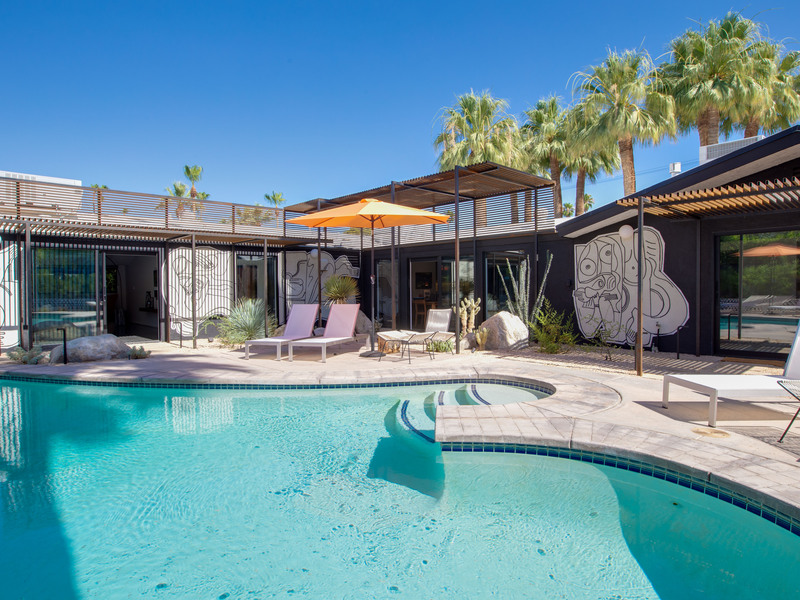 The stunning desert landscape and striking architecture create the ideal canvas for the original art masterpieces painted by renown artist Zio Ziegler specifically for this property. The Mostero House commissioned the San Francisco-based artist to create nine larger than life murals that seem to dance around the exterior of the home - creating a unique and inspiring visual experience. These words from Zio Ziegler sum up the vibe: "There is no meaning except for that which the viewer designates. My paintings begin with an existential journey, and can only end with an absurdist conclusion - the rest is just a vehicle for conveying this.'" The Mostero House sits proudly on an oversized corner parcel in Old Las Palmas - surrounded by other palatial homes, walled estates and historically significant properties with ties to vintage Hollywood. Old Las Palmas has long been the playground for the affluent and famous. 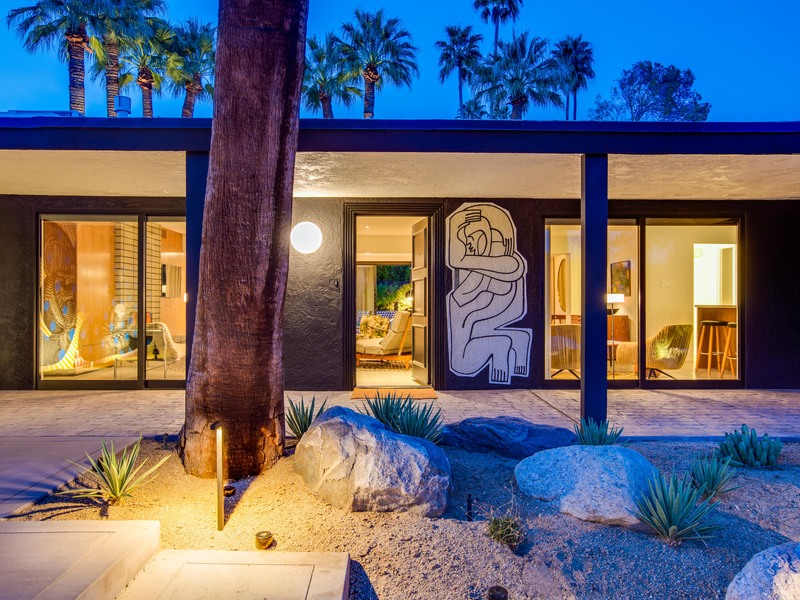 This is the perfect walking neighborhood and is just two blocks from the world famous Palm Canyon Drive as it cuts through the Palm Springs Uptown Design District. 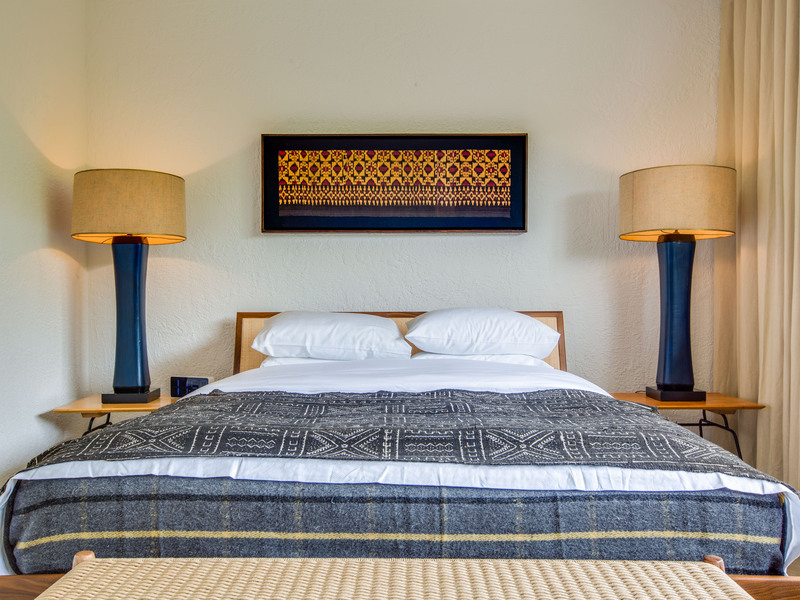 Suitable for extended long weekends, weekly stays, month-long visits and as a seasonal rental. Advanced bookings strongly advised. 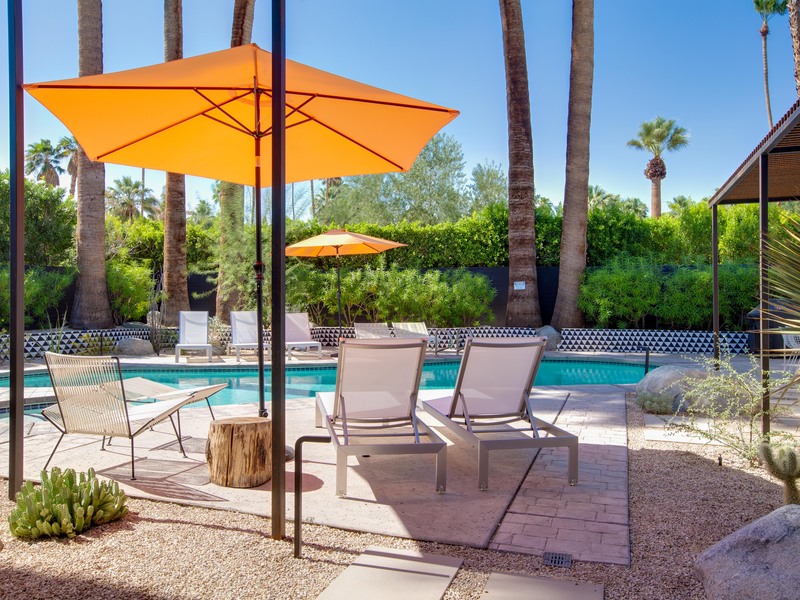 Optional concierge services including daily or mid-stay maid service, poolside massage, pre-arrival grocery stocking, and private chef can be arranged with three-week prior notice. 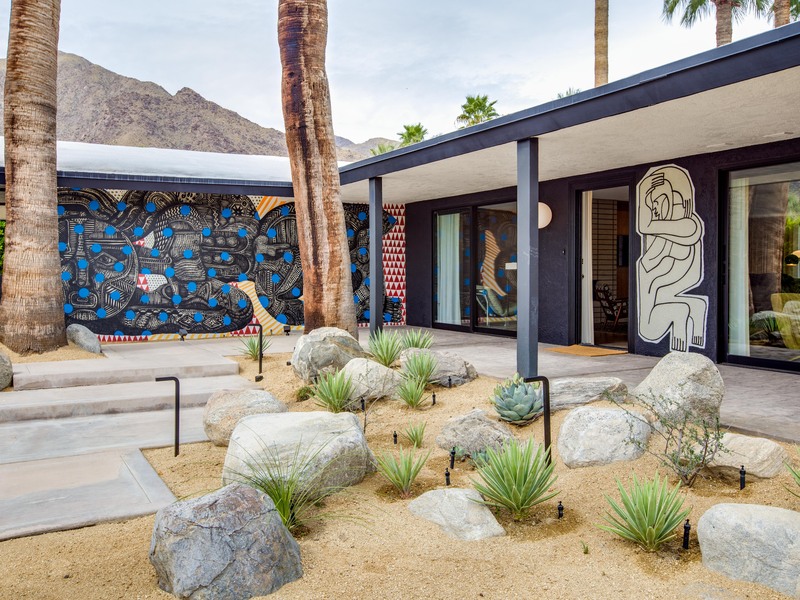 Best Neighborhood in Palm Springs! 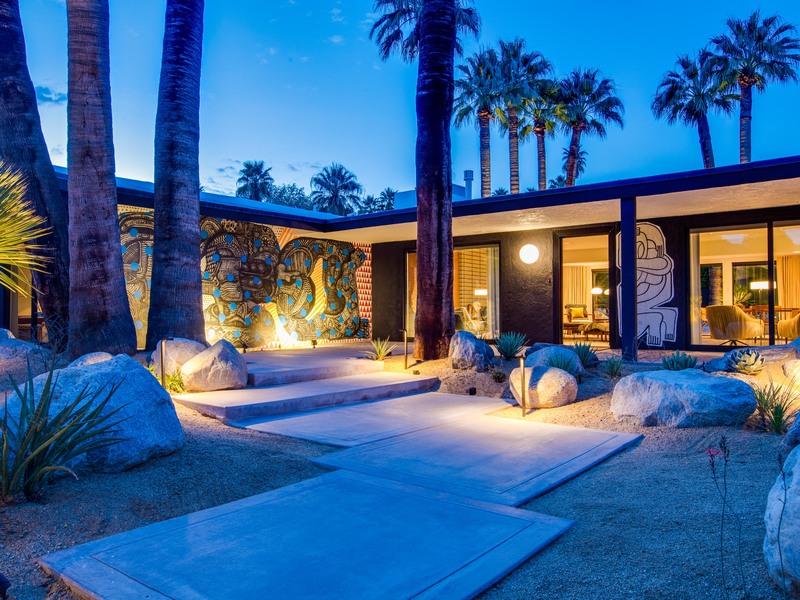 "Amazingly beautiful space in the best neighborhood in palm springs. Would absolutely stay again." "A stunning space! 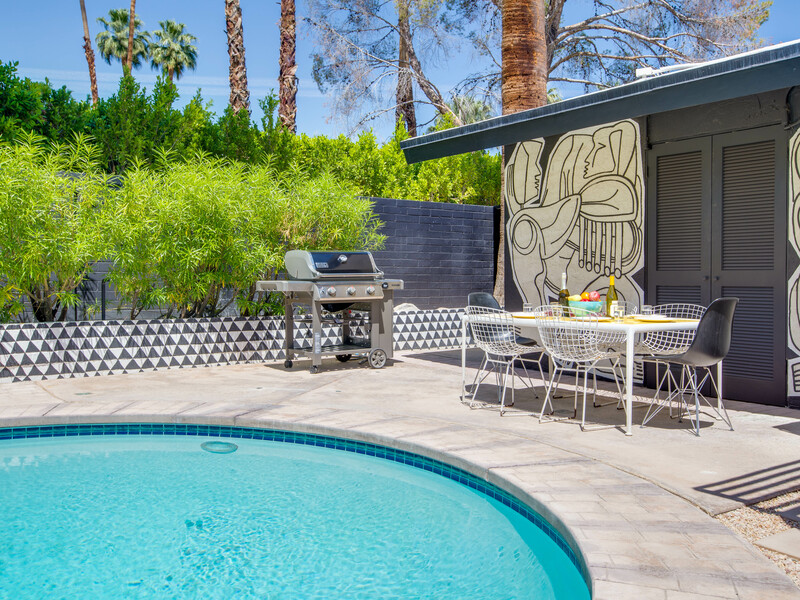 Palm Springs has strict noise policies, but the pool and house is truly special. Very close to the main strip. Would definitely recommend." 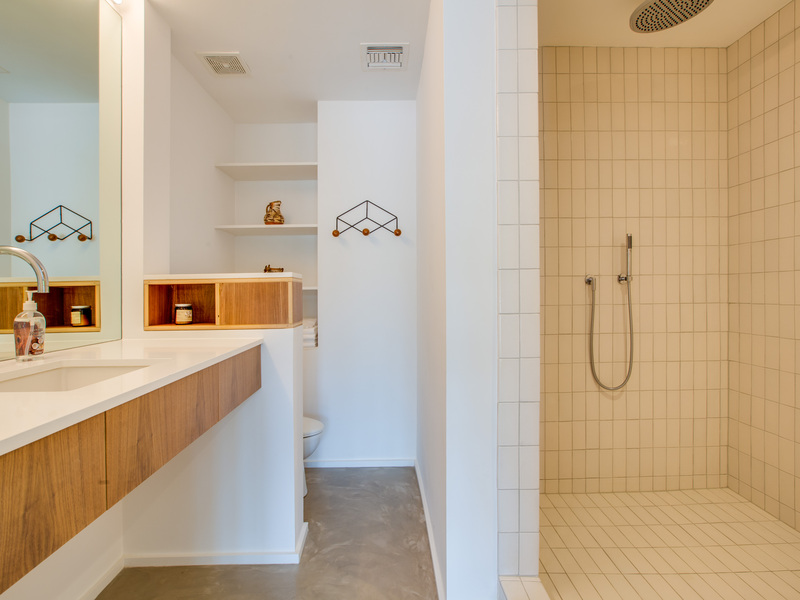 "This space was beautiful, spacious and peaceful. The House clearly has the capacity to host a lot of people, and it was a really pleasant place to hang out with a group of friends. 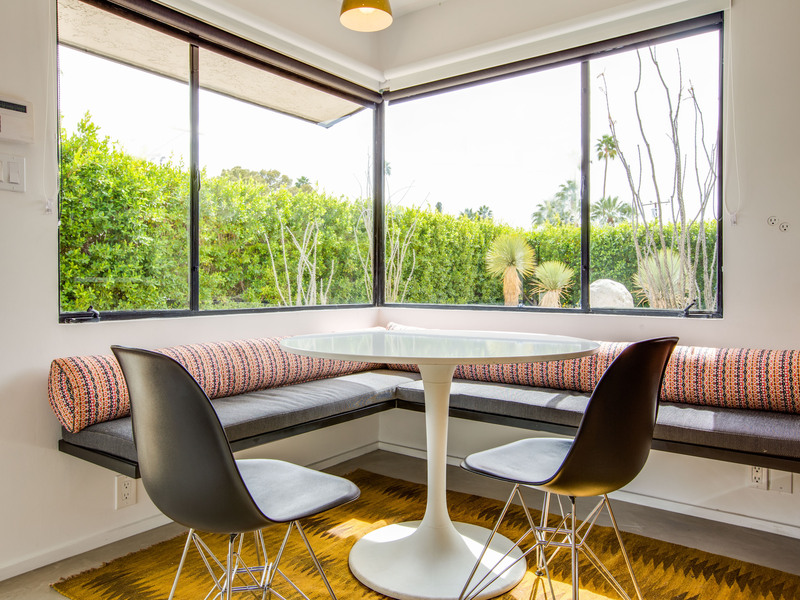 The interior design is breathtakingly beautiful -- plenty of seating in quintessential mid-century decor. 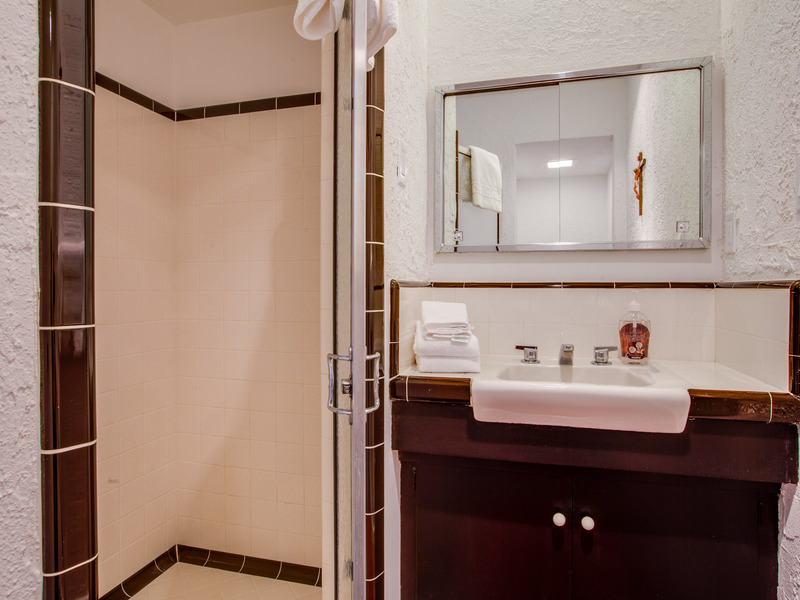 All the amenities were resort quality. We would definitely come back." "I just hosted 6 friends at the Zio Ziegler house to celebrate my husband’s birthday. Everyone arrived before we did and I got identical texts from each person saying “The house is SICK”. And it is. It may be the nicest house I’ve ever stayed in. 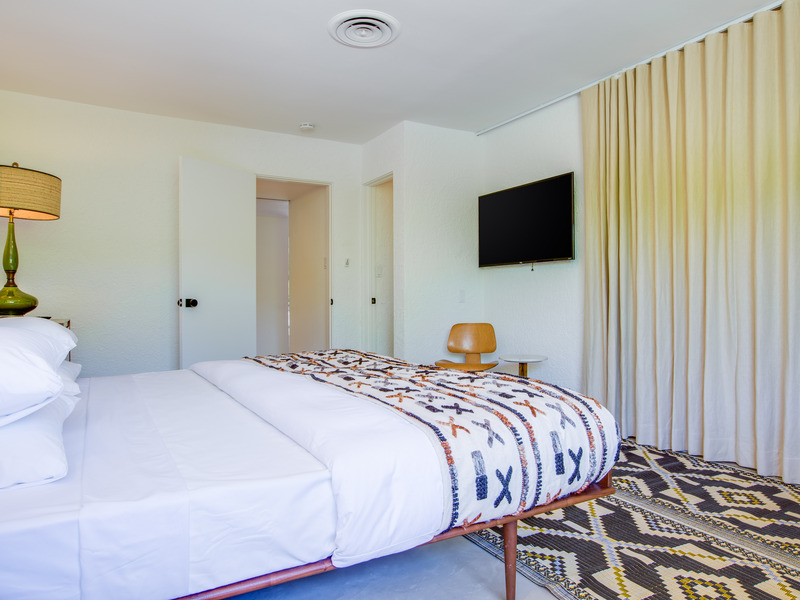 The bedrooms are all large, have their own en suites, king beds, beautiful furniture and bedding. The one thing we all could not get over was how expensive and beautiful the furnishings are. 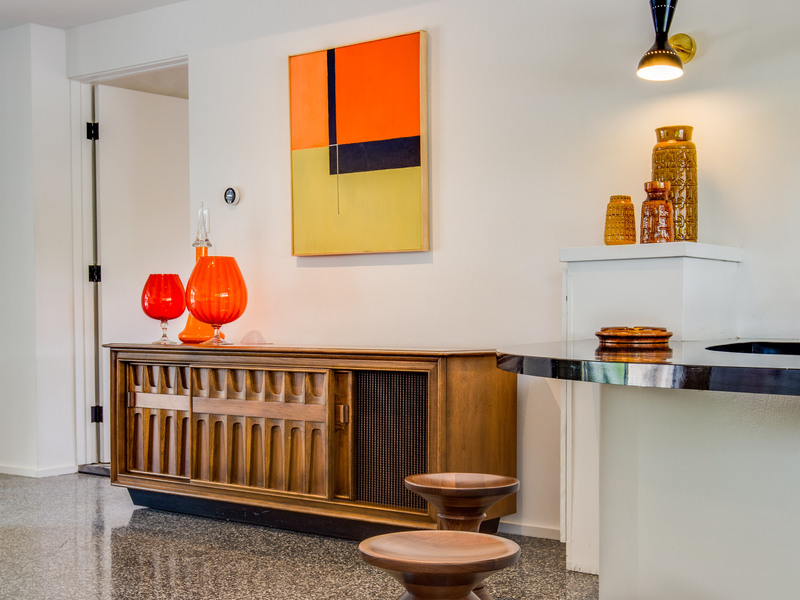 We all have knowledge of mid century antiques and this house is filled with authentic mid century antiques in impeccable condition. It’s truly a special space. The pool was awesome. We enjoyed cooking in the kitchen and on the BBQ. The location is great. There are amazing views of the mountains from the pool area. Acme was great to deal with from the get go. They’re very fast at communicating and were accommodating. It was a very good experience renting from them." "Great experience with the property manager and the property. 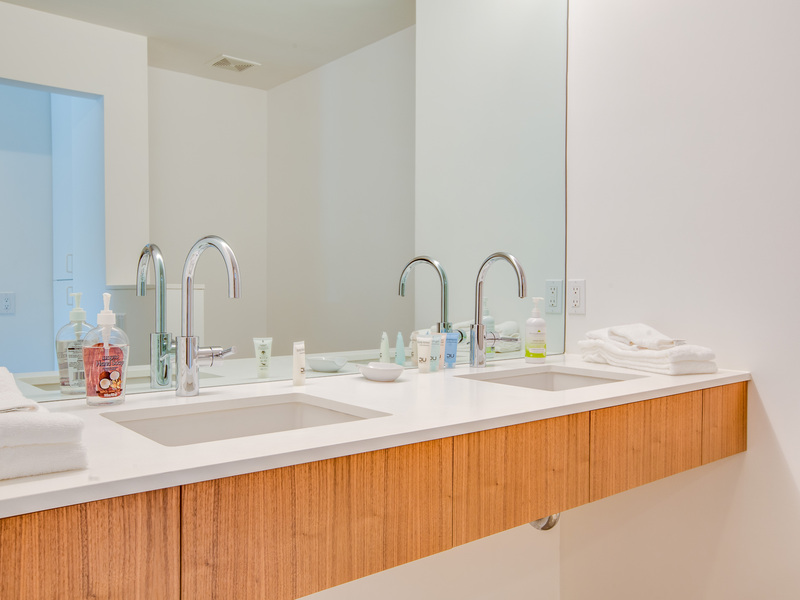 Much of the home, including the kitchen, felt totally new, and we enjoyed the style of the furnishings and amenities. Our family loved the pool, it was clean, well-maintained, with plenty of places to relax. The landscaping is also beautiful and the murals/art on both the inside and outside really provide a nice aesthetic. The location was also enjoyable, down the street from a fun bar and good coffee shop and near the main attractions of PS." "Great management and great communication!" "Location is amazing just a block from Bootlegger Tiki / Ernest Coffee. The house itself was beautifully furnished. The art murals throughout the property were stunning. 4 great sleeping quarters, huge open concept floor plan. 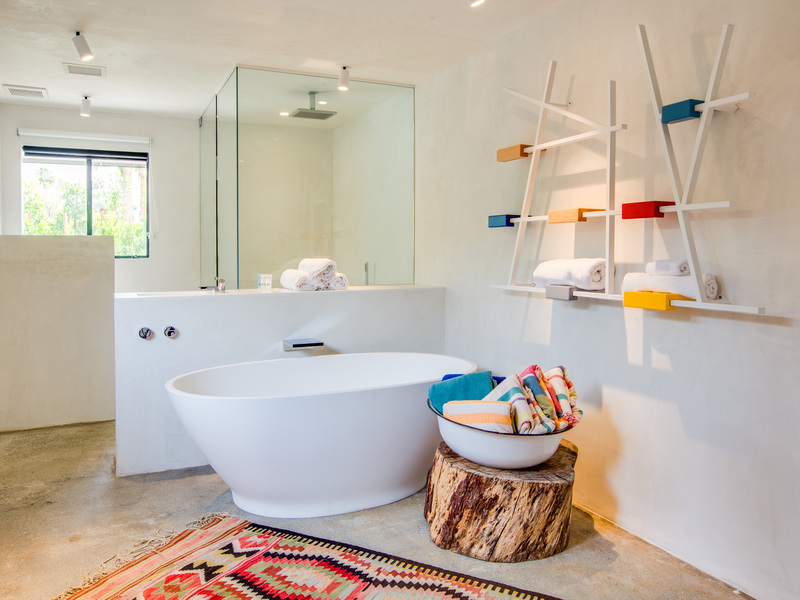 Loved the lounge area and soaking tub. The pool yard was perfect and the mountain views were inspiring. This is the perfect place for a friends getaway." "I am an Adventure Writer who travels all over the world. This is one of the top 5 vacation rental stays I have ever had. We were a group of Social Influencers on a short stay but every moment was magical. What I liked most is that this is an atypical property. 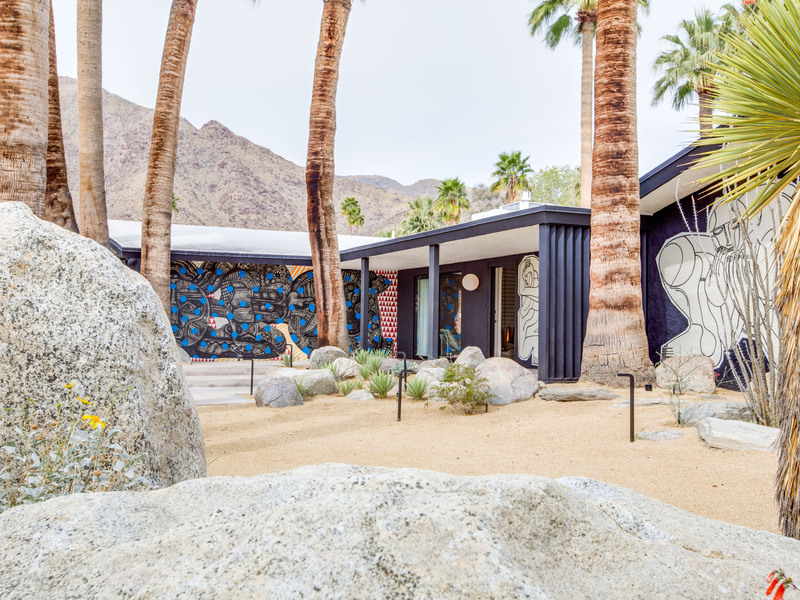 It is the perfect combination of Avant-garde sensibility and classic Palm Springs style. 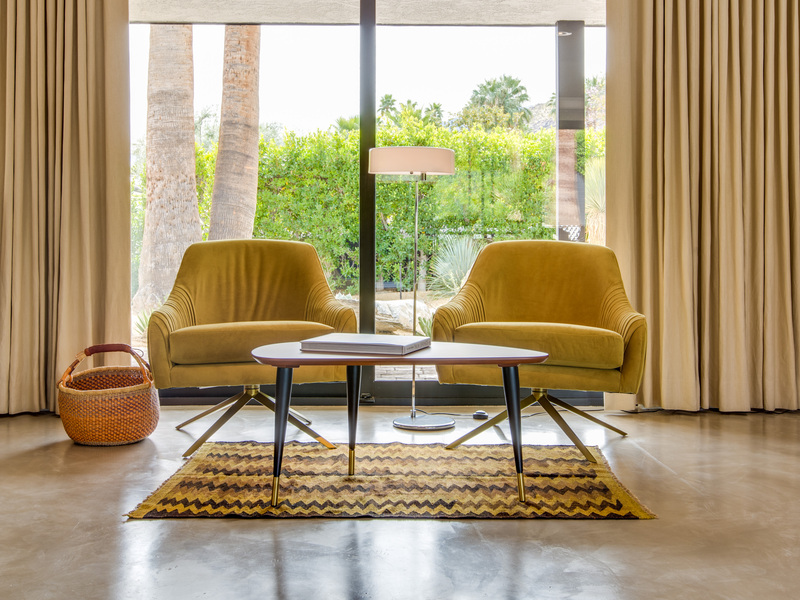 Midcentury meets Couture Home Design. 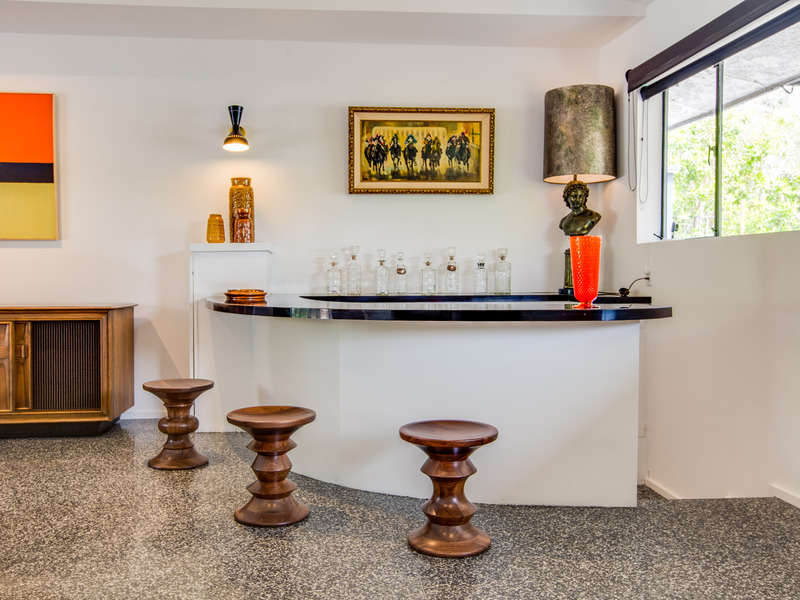 Iconic 1950s architecture combined with contemporary industrial-inspired elements. The murals by Zio Ziegler were inspiring. The furnishings were stunning. The entire vibe was low key yet elegant. Probably not for everyone but certainly for me and the ladies I was with for these few wonderful days and nights." Loved Everything About This Property! "My stay here was too short. Way too short. My job takes me all over the country to many different hotels, boutique inns and vacation rentals. When I found out my Palm Springs Girls Trip was placing us in a property that had never been rented before, my expectations were low. Upon pulling up to this property I was over the top impressed. Around every corner was another Wow Moment! The online pictures are beautiful but don't do it justice. The management company was solicitous without hovering. The kitchen was well stocked and the location was perfect - just a block or so to all the restaurants, shops and galleries. Thank you to the property owners for not pandering to the least common denominator by creating someplace very special. " 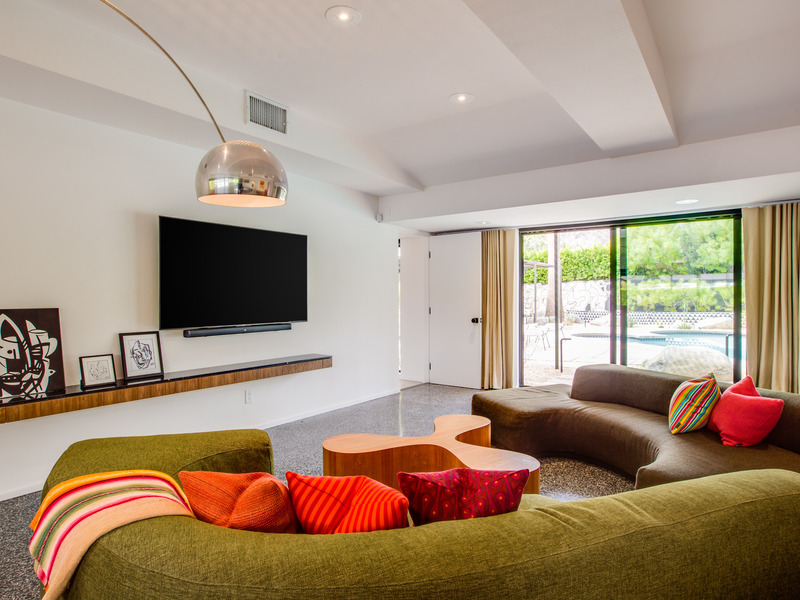 "The Zio Zigler house is very lovely--spacious and luxurious. It was not the house we actually reserved--they changed our house a week or two before we were scheduled to arrive which was stressful. However, we were very happy with our accommodations. We had a struggle getting in with the code they gave us, and had an alarm buzzing late at night on our first night there. They came out within a half an hour to deal with it, but it was still a bit annoying. 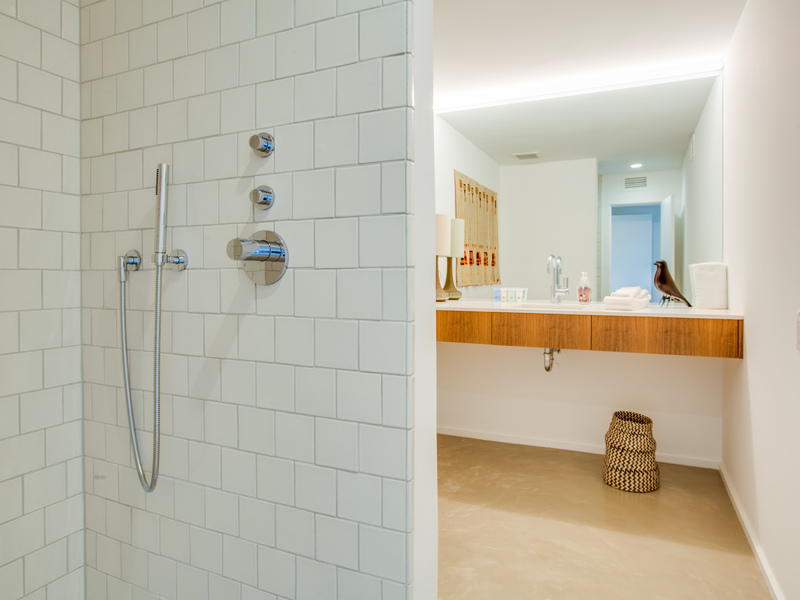 The fixtures of the house were very nice and it is very close to restaurants, etc. " 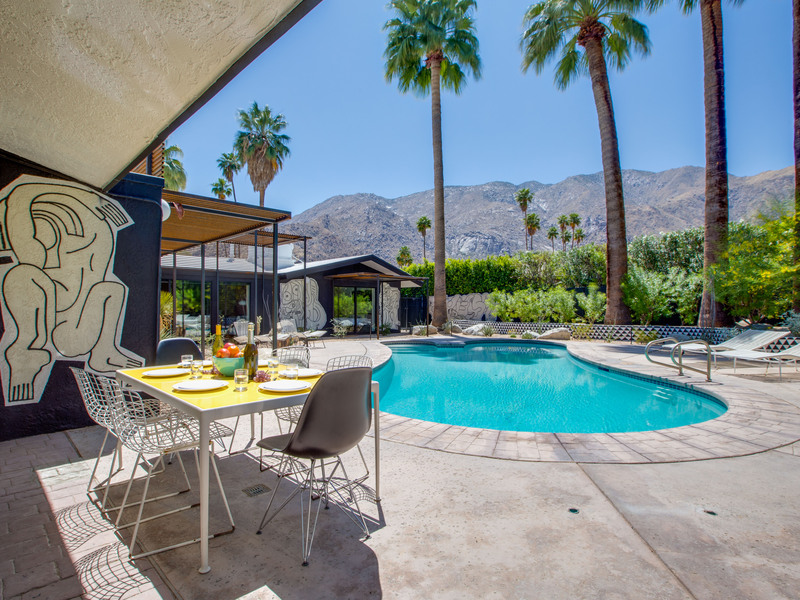 "Perfect Palm Springs experience! Love all the amenities in the house and just living there for the three nights. Missing it already!" 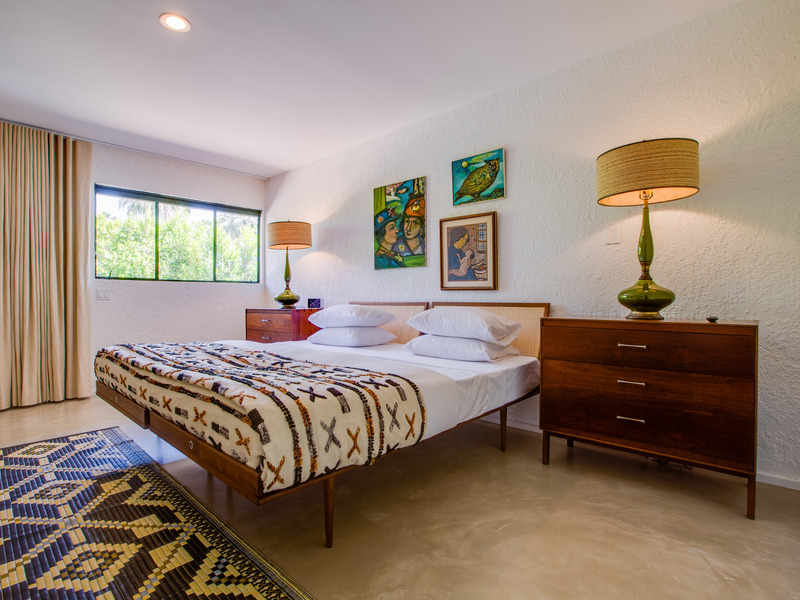 "Fantastic stay in Palm Spring. The House was great, very comfortable, very clean, well equipped, and so extremely well furnished. I love the bed, very cozy! Could not ask for anything more, and I would definitively stay here again."